Scottish bus manufacturer Alexander Dennis (ADL) has signed a deal potentially worth £2bn to build vehicles for the world's biggest producer of electric buses. The agreement between ADL and Chinese firm BYD came during the UK state visit by Chinese president Xi Jinping. The initial deal is for the manufacture of 200 single deck buses a year. The firms are also in "advanced discussions" to extend their alliance to include double decker buses. ADL is already the UK's biggest bus manufacturer, employing 2,500 globally including more than 1,000 staff at its base at Larbert, near Falkirk. The Chinese firm BYD has specialised in green energy technologies and is the world's biggest manufacturer of rechargeable batteries. Since moving into the automotive industry in 2003, it has become a world leader in solely-electric powered buses. The initial contract represents turnover of about £660m over the next 10 years. If the double decker agreement also goes ahead, that would triple the value of the deal to almost £2bn. Founding chairman of BYD Wang Chuan-fu said: "Working with top industry partners such as ADL will enable us to speed up acceptance of our vision for fully-electrified public transport systems that can make a major contribution towards the clean air challenges facing cities around the world. "ADL's know-how and local market experience in the UK, combined with their global expertise in the double deck sector and our class-leading knowledge of electric technology, creates the perfect platform to jointly develop a range of cost effective, emission-free vehicles to suit every requirement." ADL chief executive Colin Robertson said: "This is the start of an exciting journey with enormous potential and we are delighted to be working with BYD. "Their expertise in electric vehicle technology is second-to-none, while we have a global reputation for robust, reliable, high performance vehicles that deliver what they promise - and are backed by world-leading parts and service support, both in the UK and international markets. 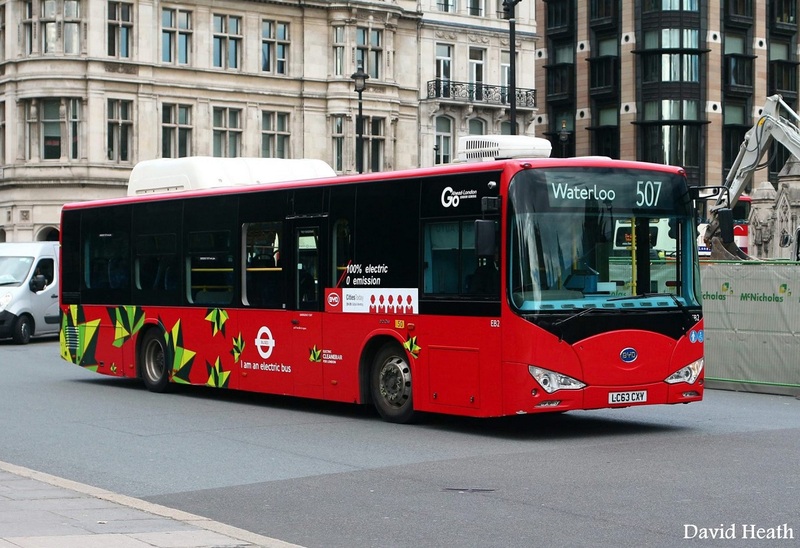 BYD and ADL first indicated their intention to work together in July this year when the former confirmed it had won an order for 51 full electric single deck buses for Transport for London. BYD buses already operate in London with two single-decks on the Red Arrow routes 507 and 521 run by Go-Ahead London as illustrated below, with five double-decks to commence service soon on route 98 operated by Metroline.